The Abayudaya are a Jewish community living in eastern Uganda. They are of the Baganda people, and their name, Abayudaya means people of Judah in their language, Luganda. There are an estimated 2,000 and 3,000 Abayudaya in Uganda, who like their Christian and Muslim neighbors are subsistence farmers. The community was founded by a military leader named Semei Kakungulu, who was originally converted to Christianity by British missionaries around 1880. However, upon further study of the Bible, Kakungulu came to believe that the customs and laws described in the Torah (5 books of Moses) were really true, circumcised his sons and himself, and declared that his community was Jewish. In the 1970’s Ugandan President Idi Amin outlawed Jewish rituals and destroyed synagogues. In the face of this religious persecutions some Abayudaya converted to either Christianity or Islam. However, a core group of roughly 300 members remained committed to Judaism. They worshiped secretly, fearful that they would be discovered by their neighbors and reported to the authorities. The community underwent a revival in the 1980s and in February 2002 approximately 400 Abayudaya were formally converted to Judaism by a Conservative Beit Din (Rabbinical court). Conversions by Conservative rabbis continued during the following years. In June 2016 Israeli Rabbi Shlomo Riskin, founding Chief Rabbi of Efrat, traveled with an Orthodox Beit Din to Uganda to oversee conversions of some Abayudaya. Rabbi Gershom Sizomu is the spiritual leader of the Abayudaya. He is a graduate of the Ziegler School of Rabbinic Studies program at the American Jewish University in Los Angeles, where he received his ordination as a rabbi under the auspices of the Conservative movement on May 19, 2008. He then returned to Uganda to lead its Jewish community. In addition to his Jewish communal leadership Rabbi Sizomu has entered politics. In February 2016 he was elected as a Member of Parliament in Uganda. The village of Namutumba is a thriving Jewish community with about 244 members with an active synagogue, which has a sister synagogue relationship with Congregation Ahavas Sholom. The Jewish community of Namutumba has built a primary school, Tikkun Olam Primary School, which is open to Christians and Muslims, as well as Jews. Congregation Ahavas Sholom provided the money to pay the school’s faculty for its first year of operation and is currently raising money to help dig fresh water wells for the school. 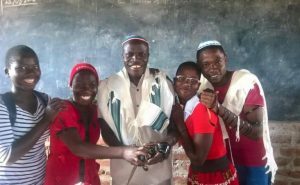 (Levi) Shadrach Mugova, who is the Namutumba Jewish community’s current spiritual leader, has visited Congregation Ahavas Sholom a number of times. Shadrach attended Uganda Christian University, where he graduated with a degree in Project Planning and Entrepreneurship in 2013. In his pursuit to become a rabbi, he studied at Rabbi Sizomu’s yeshiva and is now studying at the yeshiva run by ALEPH (Alliance for Jewish Renewal) in Philadelphia.